Robert Marshall (born October 17, 1960) is an American film and theatre director, producer, and choreographer. His most notable work is the Academy Award-winning film Chicago (2002), for which he won the Directors Guild of America Award, in addition to receiving nominations for the Academy Award, the Golden Globe, and the BAFTA Award for Best Director. A five-time Tony Award nominee, he also won a Primetime Emmy Award for his choreography in the television film Annie (1999). Marshall was born in Madison, Wisconsin, the son of Anne and Robert D. Marshall, a professor. He was raised in Pittsburgh. His sister is the choreographer and director Kathleen Marshall. He graduated from the Falk School, and then in 1978 from Taylor Allderdice High School, into whose alumni hall of fame he later was inducted. He attended Carnegie Mellon University and worked in the Pittsburgh theatre scene, performing with such companies as Pittsburgh Civic Light Opera. He debuted in the film industry with the TV adaptation of the musical Annie by Charles Strouse and Martin Charnin. He went on to direct the 2002 adaptation of the Kander and Ebb musical Chicago, for which he was nominated for an Academy Award for Best Director. His next feature film was the drama Memoirs of a Geisha based on the best-selling book of the same name by Arthur Golden starring Zhang Ziyi, Gong Li, Michelle Yeoh and Ken Watanabe. The film went on to win three Academy Awards and gross $162,242,962 at the worldwide box office. In 2009, Marshall directed Nine, an adaptation of the Broadway production with the same name starring Daniel Day-Lewis, Marion Cotillard, Nicole Kidman, Sophia Loren and Penélope Cruz, who was nominated for an Academy Award for Best Supporting Actress. Marshall then went on to direct Pirates of the Caribbean: On Stranger Tides, the fourth chapter of Disney's Pirates of the Caribbean film series starring Johnny Depp, Ian McShane, Penélope Cruz and Geoffrey Rush, which opened on May 20, 2011. Marshall directed Disney's film adaptation of Stephen Sondheim's Into the Woods (2014), and produced the film under his Lucamar Productions banner. His next film was the sequel to the 1964 film Mary Poppins, titled Mary Poppins Returns, reuniting two Into the Woods actresses: Emily Blunt as the title character and Meryl Streep in a supporting role. By December 2017, Disney was considering Marshall to direct the live-action adaptation of The Little Mermaid. As of at least 2007, Marshall lives in New York City with his partner, producer John DeLuca. 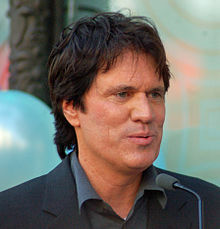 ^ "Rob Marshall Biography (1960-)". FilmReference.com. Retrieved December 3, 2018. ^ Vancheri, Barbara (May 20, 2011). "Director Rob Marshall dove into 'Pirates of the Caribbean: On Stranger Tides'". Pittsburgh Post-Gazette. Archived from the original on November 8, 2014. ^ Rawson, Christopher (August 22, 2007). "Two Marshalls win Governor's Awards for the Arts". Pittsburgh Post-Gazette. ^ Vancheri, Barbara (November 11, 2011). "Rob Marshall proves you can go home again". Pittsburgh Post-Gazette. Archived from the original on December 3, 2018. Retrieved December 3, 2018. ^ "Allderdice to induct 6 to Alumni Hall of Fame". Pittsburgh Post-Gazette. October 31, 2011. Archived from the original on May 18, 2011. Retrieved December 3, 2018. ^ Feinberg, Scott (5 January 2015). "Rob Marshall on Movie Musicals and His Journey 'Into the Woods' (Q&A)". The Hollywood Reporter. Prometheus Global Media. Retrieved 7 January 2015. ^ "Memoirs of a Geisha (2005) - Box Office Mojo". boxofficemojo.com. ^ Michael Fleming (2009-08-02). "Rob Marshall circles 'Pirates'". Variety. Retrieved 2009-08-03. ^ "Pirates of the Caribbean presented by Disney". Pirates of the Caribbean. ^ "Disney Sets Rob Marshall To Direct Adaptation Of 'Into The Woods'". Deadline Hollywood. January 11, 2012. Retrieved December 14, 2013. ^ Snetiker, Marc (September 14, 2015). "Exclusive: Disney developing new original musical featuring Mary Poppins; Rob Marshall to direct". Entertainment Weekly. Retrieved September 21, 2015. ^ Fleming Jr., Mike (December 6, 2017). "Rob Marshall Top Choice To Helm Disney's Live Action 'The Little Mermaid'". Deadline Hollywood. Retrieved December 6, 2017. ^ Urban, Robert (January 23, 2007). "Powerful Gay Men in Hollywood". AfterElton.com. p. 3. Archived from the original on May 3, 2007.